MEXICO — The district attorney for Oxford, Franklin and Androscoggin counties told those at a Domestic Violence Memorial Vigil on Monday evening that physical abuse affects “everybody,” regardless of social, educational or economic status. 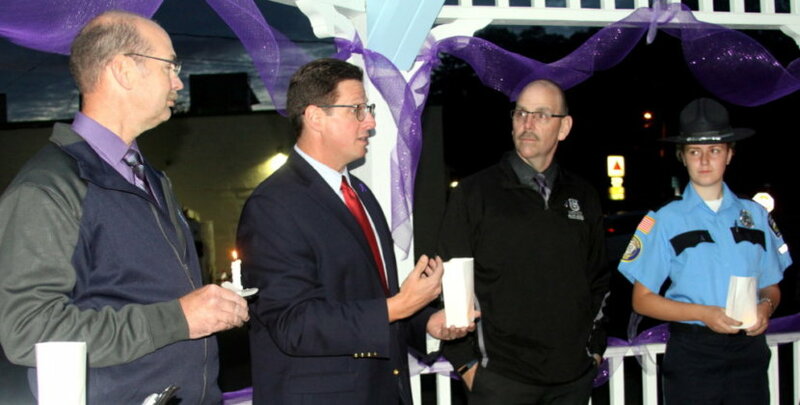 Andrew S. Robinson told about 20 people attending the vigil at the town gazebo that he’s learned much about domestic violence during his time as a prosecutor. Over time, he said, he learned domestic violence touched every social and economic situation. “I’ve met with doctors’ wives, people who hadn’t graduated from high school, people who work in mills and had good salaries, people who work three part-time jobs. The salary didn’t matter, and it wasn’t about education. It wasn’t about any identifiable group. It affected everybody,” Robinson said. “Then I realized that as you met with each victim, there were some needs that were universal, and a lot of others that came across as being very specific. If you try to approach domestic violence in a cookie-cutter fashion, you were going to do a disservice, both to your victim and ultimately to the goal of making the community safer,” he said. Mexico Police Chief Roy Hodsdon said no one entity or person can stop domestic violence. It takes an entire community that’s united. He said law enforcement is working side by side with Safe Voices, prosecutors, lawmakers, victim advocates, medical personnel, counselors, community members and others to end domestic violence. He said officers work with the victims, alongside Safe Voices and the victim advocates and prosecutors, to make sure the victim is not forgotten and their voice is heard. Hodsdon said the community is one of the last parts of the hurdle to become the united team. “Now, more and more citizens are coming forward to take the stand and make the call to the police or the dispatchers to report a possible domestic incident. Without their help, we would not be where we are today,” he said. Domestic Violence Memorial Vigils were also held in Longley Square in Norway, Meetinghouse Park in Farmington and Festival Park in Auburn.